A blast from the past – this blog was supposed to cover our trips current and past. 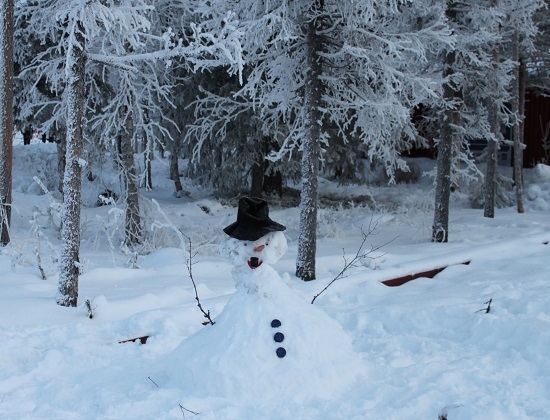 I never seem to get around to the latter but made an effort with this one – a week in Finnish Lapland, just before Christmas six years ago. Son was old enough to fully take part in all the snowy activities we had lined up but young enough to still be in awe of Father Christmas – the best of both worlds. We travelled to what they say is the last wilderness in Europe and the legendary home of Santa Claus. Meeting him here was a dream come true for Son, however that is not the only reason to visit this beautiful region. Tons of snow, actually crossing the Arctic Circle, the chance to see the Northern Lights…. and that’s just for starters. Husband and I had been wowed by Lapland a few years prior. We had two skiing holidays here before Son was born and we always wanted to return. So we came back for a week in December, just before Christmas with excitement at fever pitch levels. Long, dark days with just a couple of hours of daylight, this eerie twilight cast an even more magical spell over this snow covered world. Needless to say, every minute of this holiday was a highlight, but when pushed to pick a few of our favourite things we were all in agreement. First up the snow. Snow everywhere, coming from the UK we rarely get powdery, soft and fluffy snow in abundance which stays around. It was just glorious. 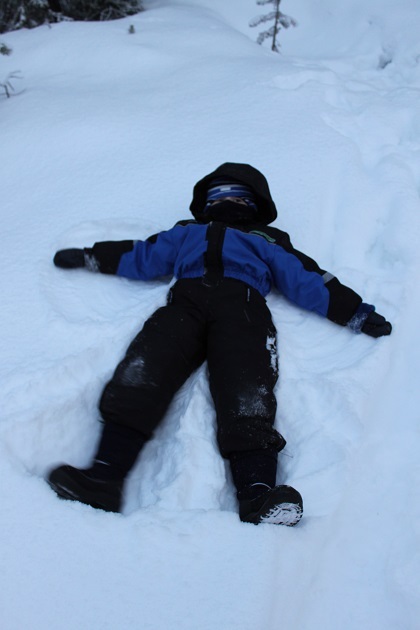 We played for hours having snowball fights, making snow angels, building snowmen and then sledging. Son thoroughly approved of a sledge as his new method of getting around. A trip across a frozen lake in a sled pulled by six energetic and lively husky dogs was just spellbinding. Thawing out afterwards in a traditional kota with tea and sausages cooked on an open fire was the perfect end to the day. 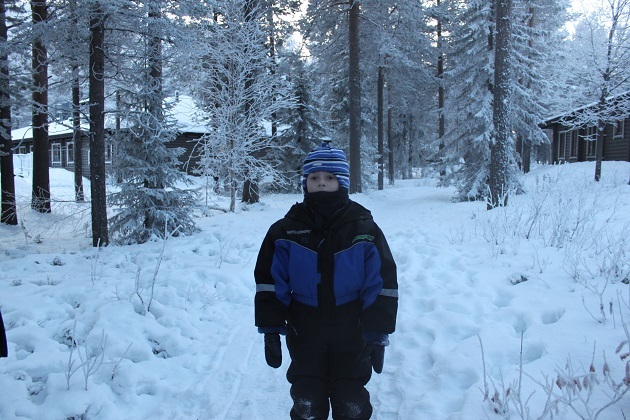 We all loved our snowmobile ride through an icy forest at sunset – 2.30 pm. 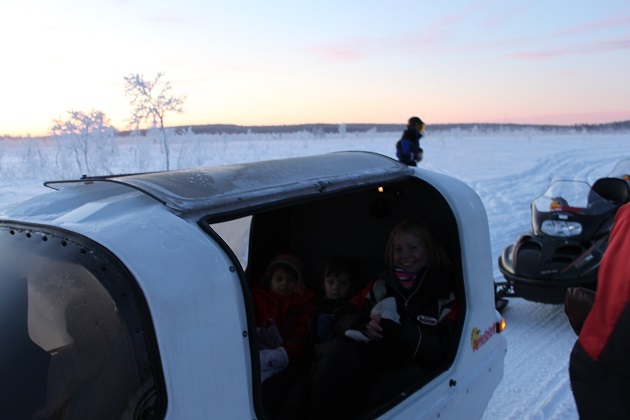 Son rode in a covered sledge, we rode the snowmobile amid the most amazing views and a superb sunset. The whole experience was exhilarating and warming up afterwards at a reindeer farm was a big hit too. 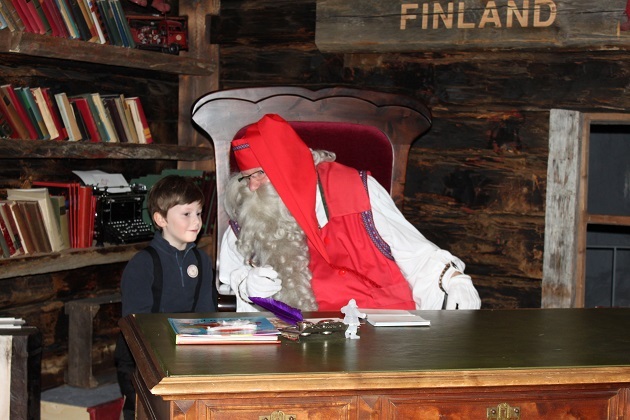 Meeting Santa Claus in his traditional homeland for Son was unforgettable. We probably loved the whole experience just as much as him if truth be told. 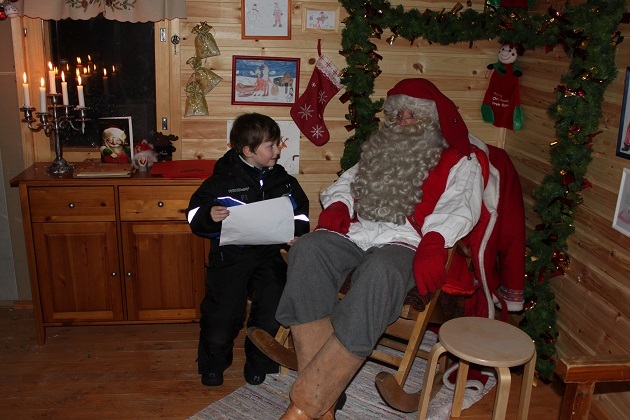 We saw the great man twice – once in his secret hideaway deep in the forest and then afterwards at the Santa Park in Rovaniemi – a touristy experience but fun and magical nonetheless. This was a holiday with a difference. Son still talks about it despite the fact Santa no longer calls at our house. He would go back in a heartbeat and frequently tells us this. But then so would we…. I’d like to do something like this with my grandchildren – maybe next year before they get beyond Santa! It’s fantastic, superb at any age really but when they still believe… probably the best time. 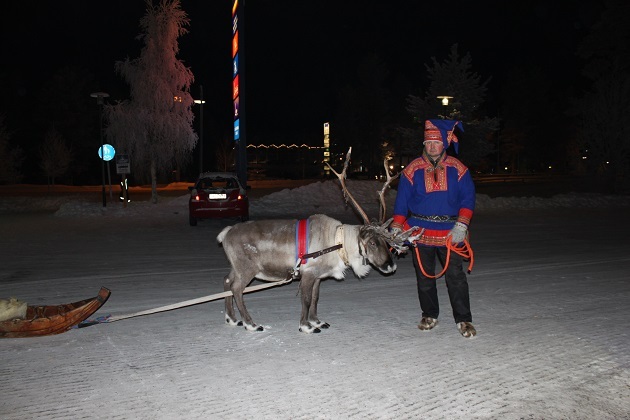 We went to Lapland a couple of years ago and had a lovely time there. Would like to go back one day to try to see the northern lights, which stubbornly refused to make an appearance for us! Really interesting to read – thank you – especially having been there, but without all the modern things to keep warm etc. how did they do it!! It’s a great place to visit – with or without kids!! We loved all the Santa stuff but so much more to see and do as well, I definitely recommend!! Finland is one of my favourite countries. We, too, have been on ski trips to Lapland, both times we flew to Ivalo and stayed at Saariselka. The twilight and the sunsets are so beautiful, just as your lovely photos are. Thank you for posting. Much nicer than all this English mist and drizzle we’re currently experiencing! 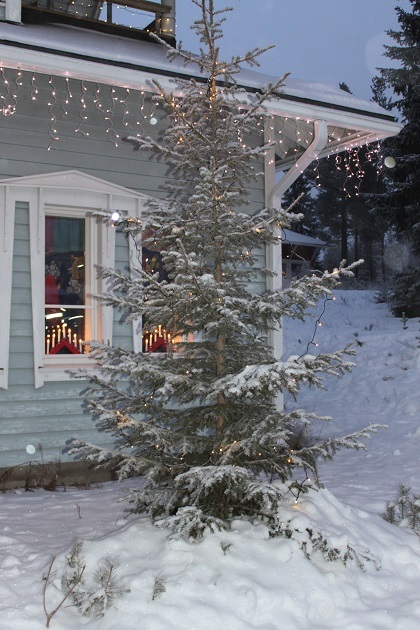 Don’t know that area, we’ve only been to this part in winter but I love Finland too – we’ve visited Helsinki at midsummer and that was wonderful. Completely agree about this awful English weather, no end to the rain, give me snow and freezing Lapland temperatures anyday!!! Aw, I can see what a great time he had from the pictures. I think I’d enjoy all of that except possibly Santa since I stopped believing a few years ago 😉 Know what you mean about writing up past trips – it’s going to be my New Year resolution AGAIN! There are just never enough hours in the week to get around to it Anabel, but I had to make an exception with this one. It’s actually quite nice revisiting old trips as well, we were all just looking at these pictures and reminiscing… trouble is now we want to go back again!! Well, that is the danger, but pictures and memories are the next best thing! The husky ride was so great – we all loved that!! Fingers crossed for those presents too!! We should have done Santa! Anyway, Finland was a great memory for us too. We had NEVER seen so much snow ever untill we went to Finland. We were up North in Ivalo trying to catch the Northern Lights and like you, we never saw them the whole time we were there either. Did you try ice fishing? We visited Santa when it was just the two of us as well – still a great experience!! We never got to try ice fishing, lots of things were cancelled at the beginning of this trip as the temperatures got so low!! 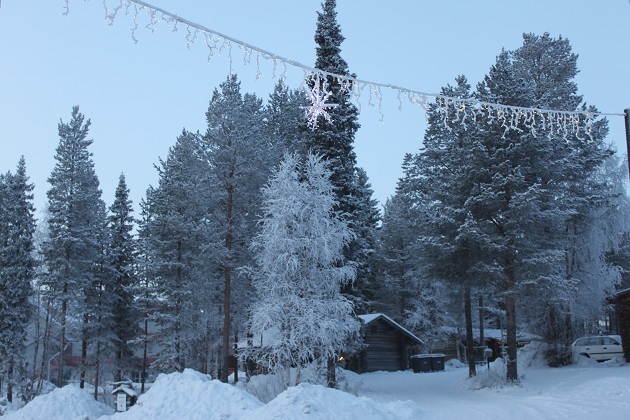 I would love to do this though, we definitely plan to return sometime to Lapland, it will be on the list! It is great. Think we will try Sweden or Norway next. But yes, the temperatures are a problem. Those little handwarmers were a lifesaver! I would LOVE to make this trip–it does look magical! It is incredible, I can’t rave about it enough, we loved every last second. This is like a fantasy Christmas Rosemary and nothing about it disappoints in reality. We loved just everything, from all that snow to seeing Santa and as for the husky ride – that was just superb. It would be a very long way for you and your little granddaughters but never say never!! Glad it is cooling down a little, I can’t imagine what it would be like with a hot Christmas, but then I think it would still be better than the damp, dreary rain and mist we seem to be having constantly here!! Hope your weekend is a great one too. What a wonderful place to spend the holidays. Looks like a winter wonderland! And your son looks so excited to give Santa his letter in that picture. He was completely overwhelmed by meeting Santa, still talks about it to this day! The whole place is incredible, it feels like a different world and perfect for Christmas. What a fun trip with a child to see Santa! No wonder he remembers it fondly. But no view of the elusive northern lights? I’d love to see that. Don’t mention the Northern Lights!!! 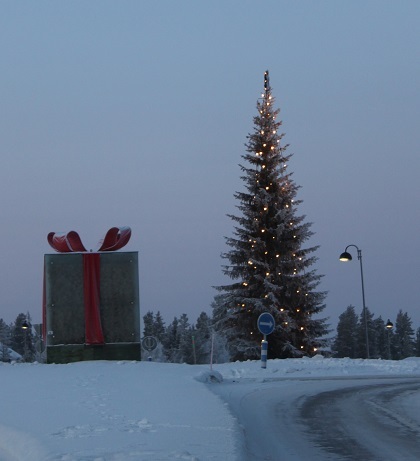 We’ve been to Lapland three times now and never even caught the slightest glimpse…. sore point!! Still, it gives us an excuse to go back, we would all love that!! Ah, good to know. I’ve thought about a trip to Iceland for that purpose alone. I guess I need to find other good reasons to go and view it as good luck if we catch them. That’s the thing, you can be really lucky or, like us, not so lucky!! What a magical looking place, Joy. Even Santa looks special, as does that beautiful sunset. I can see why you enjoyed it so much. I’m convinced this is the real Santa George!! It is a stunning place, unlike any other place I’ve been, very special. Absolutely Diana!! It reminded me of that too. It really was the best time, we all just loved this trip so much. Looks like an amazing Christmas trip! I love that perfectly snow covered tree in the first photo. This definitely got us into the festive spirit – snow and Santa, what more could anybody want in the run up to Christmas!! This sounds so cool! Whilst I would love to have an experience like this if we are talking once in a life time I should probably wait until I have a child!! Great post!! We went twice before having our son, so children are not essential!! It helps with the Santa stuff though!! Yeah I just imagine it would be a little more special! It was wonderful Suzanne, we loved every minute of our time there, now having looked at all the pictures and snowy scenes we’ve all agreed we want to return!! 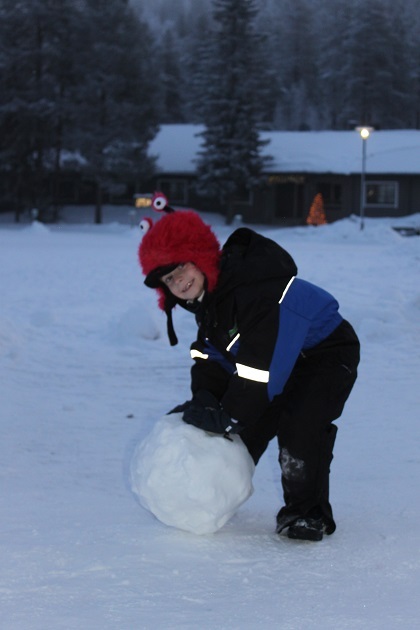 The snow here is unlike anything we ever see in the UK – it made the whole holiday extra special! How magical! I would love to see a winter wilderness like that. I think it would blow our minds, having spent most of our Christmases in Australia! It definitely is an amazing place, we rarely get snow like this in the UK either and just loved everything about the whole place, it was really magical. No shovelling at all here!! I know what you mean though, when you have to go about daily life in snow like this, probably not so easy. Arriving for a week though and just having fun, that’s something completely different. It was wonderful. Joy, I feel like a kid again! That is one magical trip that your son will never forget! 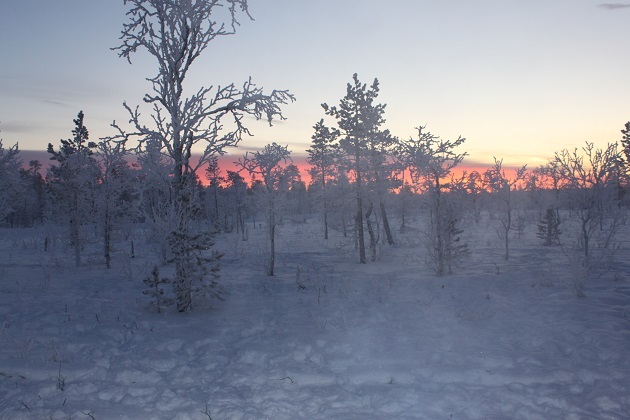 Oh I can’t tell you how magical and wonderful Lapland was Pam – we all loved it so much!! Awesome! One year I’ll get up north in the winter too. Just read the sun rises there next mid January… I want to experience that part. We’ve tracked Santa with NORAD before, our Christmas Eve tradition! We still do it even though our son is beyond Santa 😦 but fun to do anyway. 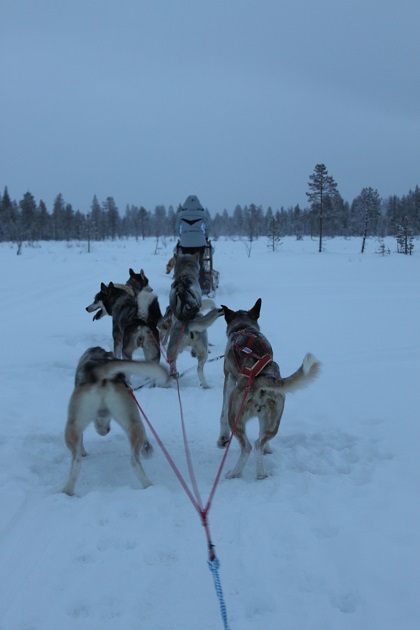 This trip to Lapland was so special, not least because of the snow. Hope your Christmas is a wonderful one too!! You make me want to go there this month itself! It really is wonderful – very beautiful and very different, I recommend it for sure!! I was just talking to my husband about spending next Christmas in Lapland! I am going to show him this post and twist his arm. 🙂 Thanks Joy! Oh it’s just magical Jenny, a real holiday of a lifetime. Zoe would love it there, but so would you two!! I would love to visit beyond the Arctic Circle again too – we talked about Norway being next on our hit list! I know exactly what you mean about this weather – rain and wind do not do much for the festive spirit!! 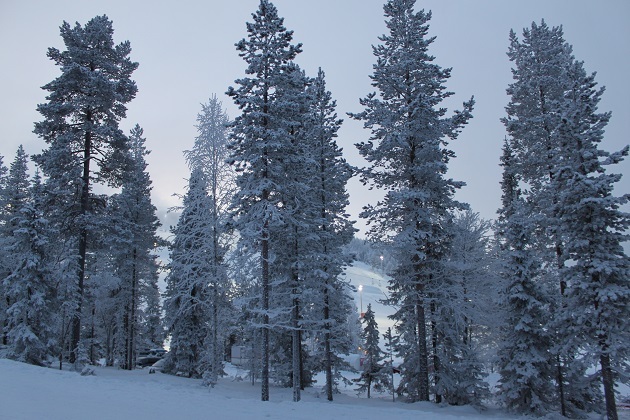 Thank you – the snow just makes everything so magical doesn’t it? Wow Joy, what an amazing trip! I wish we lived closer so we could do this. We went to Scandinavia in the summer, but I can imagine it is just as magical (if not more in the winter). Happy holidays! It really was wonderful Kirsten with the snow, Father Christmas and all those fun activities. You’ll have to try a trip in winter sometime!! Hope your Christmas is a magical and wonderful one. Thank you Coral – it is such a beautiful and magical place. Amazing – you’ve just made me want to make this happen even more now! It’s amazing – definitely something you should do with your little monkey!! It is just the perfect winter holiday! !